Principal Jason Lytle receives an award for Hartranft School showing three consecutive years of improvement on their overall SPR scores. 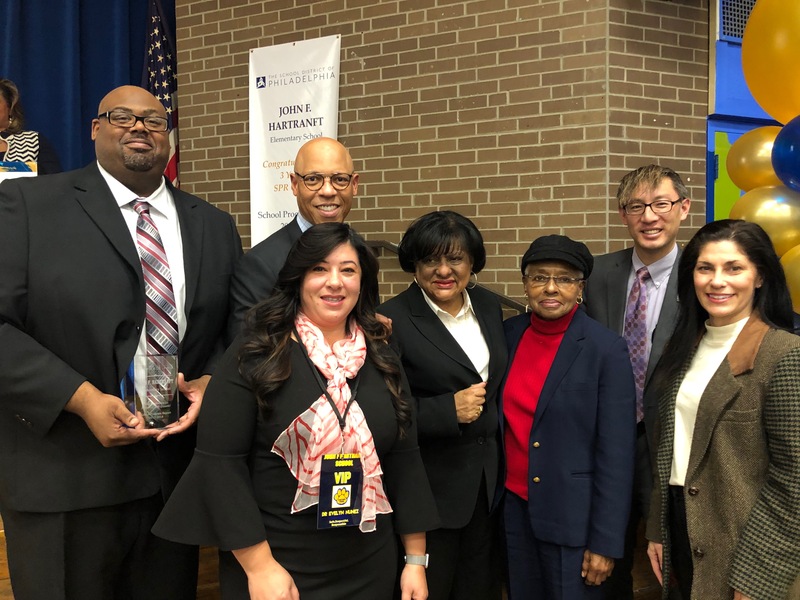 PHILADELPHIA – The School District of Philadelphia celebrated three consecutive years of improvement among both District-led and charter schools. Results released today from the 2017-2018 School Progress Report (SPR) show that the average Overall SPR score for citywide schools increased nine points from 33 percent in 2014-2015 to 42 percent in 2017-2018. Mayor Jim Kenney and Superintendent Dr. William R. Hite visited John F. Hartranft School in north Philadelphia to celebrate the achievement with Hartranft Principal Jason Lytle, City Council President Darrell Clarke, City Councilwoman Jannie Blackwell, Board of Education members, students, parents, staff and principals from schools around Philadelphia. five top-scoring schools on the 2017-2018 SPR were honored. The SPR is the District’s primary tool to measure progress towards the Action Plan 3.0 anchor goals on grade-level literacy and college and career readiness. Now in its sixth year, the SPR evaluates schools in multiple areas, including student achievement, student progress, school climate, and for high schools, college and career readiness. The SPR speaks to the District’s belief in school autonomy, paired with support and accountability, and is a transparent, actionable way to gauge the progress and achievement of a school. Schools across the city also made improvements in the individual domains used to calculate SPR scores. Since the District launched Action Plan 3.0 in 2014-2015, the following percentage of schools have increased in each domain: 53 percent, in Achievement; 63 percent, in Progress; 69 percent, in Climate; and 63 percent in schools serving grades nine through 12, in College and Career Readiness. 69 percent of students in District-led and alternative schools are graduating, up four points. Hartranft, which hosted today’s celebration, is a school that has increased its Overall SPR score every year for the past three years. Starting at seven percent in 2014-2015, its Overall score jumped to 47 percent in 2017-2018. Its individual domain scores have also made impressive jumps, especially in Progress and Climate, where scores over three years have risen 75 percent and 30 percent, respectively. Hartranft was designated as a focus school as part of the District’s Systems of Great Schools initiative in 2016-2017. At that time, Hartranft created and implemented its own academic improvement plan, which consisted of accelerating student achievement through the consistent use of small group instruction, reduced class sizes, and dedicated staff focused on increasing attendance and better supporting bilingual families. Dr. Hite also invited the greater Philadelphia community, including businesses, elected officials, nonprofit organizations, and interested volunteers, to be part of the progress made in schools. SPR scores for all schools can be found online at philasd.org/spr.